Unofficial impression of the proposed development in Triq tal-Mirakli, Lija, produced by objectors. 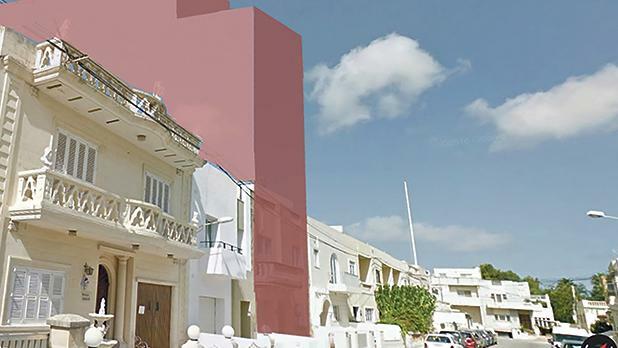 Lija residents are objecting to plans for a five-storey apartment block in a street just outside the village core which currently features only two-storey terraced houses. Residents say the proposal in Triq tal-Mirakli, similar to several that have increased across the island since changes to planning policies encouraging such developments, would jar with the streetscape and would have a cascading effect on its surroundings. In representations to the Planning Authority, they argue that the excessive height would tower over neighbouring buildings – all built in similar architectural styles – and that planning policy dictates a more sensitive approach with respect to the existing surroundings. They also argue that the building’s depth would project into surrounding third-party citrus gardens, which they say had so far provided the only greenery in the area. Moreover, residents raised concerns about the effect excavations could have, as the row of houses were all built over shared ground beams in the 1970s, over a backfilled quarry known to have been used for the building of the Lija parish church. The Lija local council has not objected to the development, which is open for public consultation until March 29 and has yet to be assessed by the PA. Residents say the application is symptomatic of wider changes in Lija and neighbouring towns, where terraced streets are increasingly playing host to more intensive residential developments which are seen as changing the areas’ character. The Planning Authority is also considering a controversial proposal to demolish a traditional farm building within the Lija urban conservation area to build a 24-room boutique hotel, extending into adjacent ODZ fields to include a swimming pool and other facilities. Concerns have been raised by both the Environment and Resources Authority (ERA) and the Superintendence for Cultural Heritage (SCH), with the latter highlighting the Merino Street building’s important traditional architectural features and the effect on neighbouring properties. Residents have warned that the hotel – rising to a maximum of four floors in a predominantly two-storey area – will have a negative impact on the residential area. The Lija local council has also objected, citing the “unacceptable visual impact” and the “ruin” of the surrounding agricultural area. The council also took issue with the lack of parking facilities in the plans, which it said would exacerbate existing problems and increase traffic congestion in the town.